Artificial wave technology has found an unlikely ally in one Pharrell Williams. 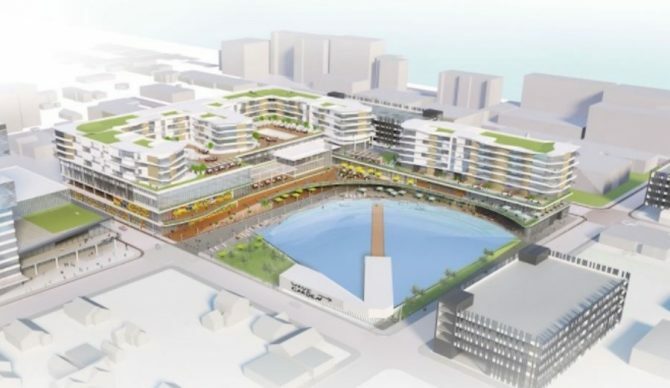 The pop superstar has reportedly come on board as a partner to develop one of Virginia Beach’s most valuable properties – called the Dome Site – and baby, they’re putting in a pool. A wave pool. According to the Virginia Pilot, there are numerous proposals under consideration for the development of the site, but the one proposed by Venture Realty Group, which includes Pharrell, is the front-runner among city officials. Besides shops, restaurants, and apartments, the proposal includes a surf park that would leverage Wavegarden’s “newest technology,” which we can only presume (also from looking at the renderings) refers to Wavegarden’s “Cove.” Wavegarden did not immediately respond to our request for comment. The proposal is the most recent in a spate of proposed surf parks in the U.S. – we recently reported CitySurf’s plans to build a park in Seattle, and Kelly Slater Wave Co.’s Palm Beach project. Virginia Beach councilman Louis Jones told the Virginia Pilot that there’s currently no deadline for negotiating with Venture Realty Group. In other words, no news on when the Virginia Beach Wavegarden might open if the project is approved.